Original Australian Daybill movie poster. 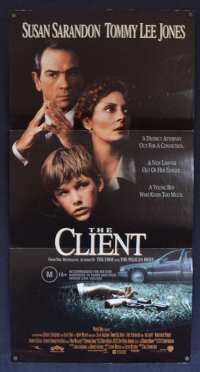 The Client is a 1994 American legal thriller film directed by Joel Schumacher, and starring Susan Sarandon, Tommy Lee Jones, and Brad Renfro. It is based on the novel of the same name by John Grisham. The film was released in the United States on July 20, 1994. For her work in the film, Sarandon was nominated for an Academy Award for Best Actress and won a BAFTA Award for Best Actress in a Leading Role. Comments: There are some random scuff marks.